Ideally located in the heart of Rosebank in one of Johannesburg’s most popular suburbs. 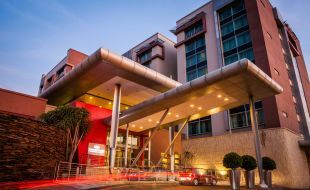 The hotel is only two blocks away from The Rosebank Gautrain station, a 30-minute drive from O.R. Tambo International Airport and just a short drive from the Johannesburg and Sandton Business Districts. The hotel offers eight well-equipped conference and event venues that can accommodate up to 300 delegates. Guests can enjoy the hotel amenities such as a great in-room service menu available 24 hours a day, Fresh restaurant, a business lounge, a 24-hour gym for fitness enthusiasts, the IHG club lounge, a relaxing Zen garden and an on-site indulgent spa. It’s the ideal place to stay when travelling for business or leisure. Offer valid for stays until 31 January 2020 must be taken up over the same period. Offer is valid for bookings of 9 rooms or less. Offer valid for stays of a minimum of 7 or 30 consecutive nights. A full, non-refundable pre-payment is required at time of booking (Payment negotiable at hotel level for bookings exceeding 30 consecutive nights). SunRands may be redeemed and earned on this rate. No additional discounts apply on this offer. Rates include Value Added Tax but exclude a 1% Government Tourism Levy charge per room per night.